This week marks the 40th anniversary of the fall of Saigon, a national holiday in Vietnam better known as Liberation Day. 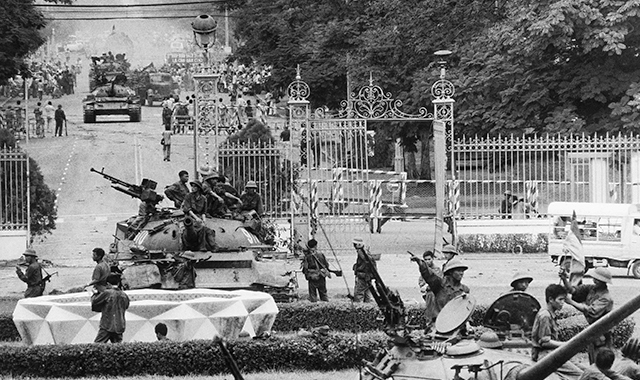 The event signified the end of the Vietnam War, culminating with a North Vietnamese army tank bulldozing through the gates of the Reunification Palace – the residence of the president of South Vietnam – and major helicopter evacuations of American military personnel and Vietnamese citizens. Yet four decades after the controversial war, the Vietnamese public sees the United States as a helpful ally and even embraces some of the core tenets of capitalism. Today, the Vietnamese view the U.S. in a positive light. About three-quarters of Vietnamese (76%) expressed a favorable opinion of the U.S. in a 2014 Pew Research Center survey. More highly educated people (89%) gave the U.S. especially high marks. Young people ages 18-29 were particularly affirmative (89%), but the U.S. is seen positively even by those who are old enough to have lived through the Vietnam War. Among those ages 50 and older, more than six-in-ten rated the U.S. favorably. The U.S. and Vietnam have built strong economic ties since war’s end, reflecting the Vietnamese public’s desire for increased participation in international trade and their views that the U.S. is the top player in the world economy. Despite the Vietnamese government’s single-party socialist framework, an overwhelming majority of Vietnamese (95%) agreed that people are better off in a free market economy, even if some people are rich and some are poor. An equal percentage voiced the opinion that growing trade and business ties between Vietnam and other countries is a good thing. Specifically, most view international trade as having positive effects on job creation (78%) and raising workers’ wages (72%). Since officially normalizing diplomatic relations in the 1990s, Vietnam and the U.S. have enjoyed a strong economic partnership. The two countries traded more than $35 billion in total goods in 2014, with Vietnam counting the U.S. as its largest export market. As negotiations continue over the 12-country Trans-Pacific Partnership – a free trade agreement between Pacific nations that includes Vietnam and the U.S. but excludes China – the Vietnamese public picked the U.S. as the world’s leading economic power (56%), eclipsing regional powerhouses Japan (14%) and China (11%). Looking to the future, Vietnam sees the U.S. as an important ally. When asked about what countries they can rely on as a dependable ally in the future, more Vietnamese chose the U.S. than any other country. Conversely, China is viewed as the greatest threat to the future of Vietnam. This sentiment may be driven in part by territorial disputes between China and Vietnam in the South China Sea, an issue that a majority (84%) of Vietnamese worry could lead to a military conflict.